Food Pantry location: Tuesdays from 3:00 to 5:00 p.m.
Laura Dean-Frazier runs this pantry with the help of Betsy Morse and many volunteers. Volunteers are needed to help guests carry their groceries out during Pantry Tuesday at 3:00! Hi April , I am writing to you to give some feedback on the crew at the Old Saybrook Food Pantry. The crews on Monday and Tuesday mornings are doing a terrific job setting up the food stations for the Pantry distribution. The crew is on time, always ready to work hard, and everyone has a positive attitude. The members of the crew are familiar and consistent with the job tasks, complete them in a timely fashion, and with great quality of work. The crew is friendly, social, and works well with the other volunteers. Elissa, Job Coach, is always present with the crew which has made a big difference with the crew learning the tasks and mastering the tasks. She provides important cues to help the members with their job responsibilities and always offers positive feedback to the crew. Elissa is very upbeat and is an excellent role model to the members of how to interact and work with fellow volunteers. She plays a pivotal role as a Job Coach and it shows through the determination of all the members wanting to complete their job responsibilities to the best of their abilities. Elissa has done an impressive job of helping each member take on more work duties as they learn and improve their work skills. As a Manager of the Old Saybrook Pantry for Shoreline Soup Kitchen & Pantries , myself and our organization are very grateful for Elissa and the Sarah Crew who have volunteered many hours of work! Thank you to Dee Tully, from the Clinton Rotary, and Sandy Voss, from the Clinton Fire Department, and many community members who helped make 500 Easter baskets that were distributed at SSKP's Clinton, Old Saybrook and Westbrook pantries - and thanks to everyone at Families Helping Families in Clinton who provided chocoloate bunnies. "The Clinton Fire Department and Clinton Rotary organised this project BUT...The Easter Baskets are made with love from so many people. The Fire Department, Rotary, DPW members, the Pretty Committee, schools, Stop & Shop, Technique, Shoreline Women’s, Chamber members, the Brilliant and Entertaining Women of Clinton, Girl Scouts and a host of great families. It’s safe to say our Community built them! CVFD members - specifically Linda Gworek (who wears MANY hats: she is a member of both FD and Rotary) and Rotary members and the entire Clinton community!! Many groups have made giant donations (Clinton Outlets, Clinton Chamber of Commerce, Clinton Shoreline Women, Stewards ACE Hardware - just to name a few) many private donations - We are so lucky to have so many generous friends in our community!!!! And so happy that we could make this happen again this year - our 5th!!" Old Saybrook Middle School Stuff the Shelves - 560 lbs. of food collected. December 3rd a food drive was brough in by Grossman Chevrolet & Nissan. Cram a Van! 124 pounds. Parents from Goodwin! The students did an amazing job! Everyone was so generous! Goodwin School Food Drive - 608 lbs. of food, $353 cash, $140 gift cards. Stuff-a-Cruiser at the Old Saybrook pantry. The Yoga Shop raised the most food (half a ton of food) at this amazing community event put on by Project Courage. Many local organizations participated in this Dodgeball Event. Over 2,000 lbs. of food! Pictures below - food collected and the Yoga Shop Dodgeball team. 3rd Annual Neighborhood Food Drive - Maynard Road/Circle Old Saybrook - 374 lbs. A big thank you goes to Clinton Rotary Club and Clinton Fire Department for donating 125 Easter Baskets to the families at the Old Saybrook food pantry. Business & Legal Reports held a food drive on March 5th and collected 251 lbs. of food and raised $145.00. Thank you! December 15th Stuff a Cruiser for the Old Saybrook pantry. Stuff-a-Cruiser donated 857 pounds of food. There were also coats donated. Thank you! Food drive donations for Old Saybrook pantry from the Cub Scouts. Old Saybrook High School National Honor Society held a food drive on October 28th. Here are two of the students who dropped off the food. Thank you! CBSRZ Food Drive for SSKP Fills the Shelves: Many thanks to Congregation Beth Shalom Rodfe Zedek in Chester. This year's annual food drive during the High Holy Days was a huge success - with 2,146 pounds of food donated. We are so thankful to everyone at CBSRZ! She had her friends bring food donations instead of presents. June 4th and it was 71 pounds of food. Thank you Congregation Beth Shalom Rodfe Zedek for organizing a Stuff-a-Truck Food Drive at the Old Saybrook Stop & Shop. We'd also like to thank Stop & Shop and everyone in the community who donated – they collected 480 pounds of food and $112.00 in donations – thank you!! Thank you Old Saybrook Fire Department! The Old Saybrook Fire Department donated food for the Old Saybrook pantry from the 6th Annual Firehouse Food Drive for SSKP, held across the shoreline on Saturday, April 8th. The kids from the Helping Hands group at the First Church made these cakes for the guests at the Pantry for Easter. Tina and Cory helped them with this wonderful project of 40 large cakes and 24 mini cakes. Each year, for more than the past 20 years, Congregation Beth Shalom Rodfe Zedek (CBSRZ) has organized a High Holiday Food Drive. This year was another successful year, with over 2,000 pounds donated. Thank you CBSRZ, we are truly grateful for your continued support. We wish you all a happy, sweet New Year. We would also like to thank The Safety Zone for supplying one of their trucks for the storage and transportation of the donated food to the SSKP pantry at First Church of Christ in Saybrook (Congregational) in Old Saybrook. Our ladies supporting the UCONN Huskies at the pantry. A special thank you to the Old Saybrook Fire Department for all their hard work with the amazing food drive and money that they raised. Thank you! The Old Saybrook Middle School did their Stuff-a-Shelves Food Drive and donated 1,824 lbs. of food to the Old Saybrook food pantry. A big thank you goes out to all the students, staff, and parents! We received boxes and bags of food, pet food, and hats, mittens, scarves from Traditional Performance Firearms to our Old Saybrook Pantry – for a total of 447 lbs. Thank You! Tantor Media’s Annual Food Drive for our Old Saybrook Pantry was a huge success, collecting 528 pounds of food – thank you! A big thank you to Walgreens in Westbrook! Jay and another employee came in did free flu shots for two hours during Pantry on Tuesday, October 27. They gave 23 flu shots. Thank you! CBSRZ Food Drive for SSKP Fills the Shelves: Congregation Beth Shalom Rodfe Zedek in Chester held an annual food drive during the High Holy Days, raising a total of 2,361 lbs. of food collected. Sandy Seidman, a member of the congregation and the owner of Safety Zone, arranged for a large truck to deliver the food to SSKP’s Old Saybrook pantry, where CBSRZ and SSKP volunteers unloaded hundreds of bags of food to be weighed and sorted for distribution. Thank you! First Church Kids Helping kids! Many thanks to the First Church Kids, led by the Family Ministry Team at First Church of Christ in Saybrook (Congregational). Their food drive filled 100 string bags with healthy summer snacks for kids, and included special notes and drawings from the youth group. Their hard work and thoughtfulness will help many families in need! Traditions Performance Firearms held a special drive for SSKP’s Old Saybrook Pantry. They donated 259 pounds of non-perishable food, as well as winter coats, hats, gloves, and even pet food. We thank everyone who donated to their drive for remembering those in need! preparing many Heat & Eat meals. A big "Thank You" to Tantor Media, whose drive collected 295 lbs of food for SSKP's Old Saybrook Pantry! Many thanks to Beth and Cede Peno - Cede grows a garden with her grandfather and has a stand at Riggio's. Cede donated $650 , 44 lbs. of food, and 352 lbs. of diapers and baby products. 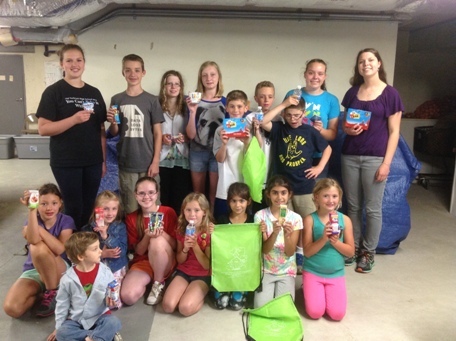 A group of students from Youth & Family Services came to the Old Saybrook pantry on July 15, 2014 with a food drive from Stop & Shop and helped with organizing food and with set up for the pantry. Godiva employees volunteering at the Old Saybrook food pantry. Goodwin students dropped off food from a food drive. Rolls Royce Naval Marine donated food from a recent food drive. Girl Scout Troop 62379 from Old Lyme made cookies for the Food Pantry for Valentine's Day. Please help - We need food. Anyone who is interested in doing a food drive would be great! We need juice! canned, bottled, juice boxes. Please note: When someone makes a donation, make sure that the food items are current - no expired dates on cans, bottles, or boxes. For fall/holiday donations, please make donations on Mondays (9:30 to 11:30 a.m. and 3:00 to 4:00 p.m.), and Tuesdays (10:30 a.m. to 2:00 p.m.). To arrange another time if needed, please call Laura at 860-514-2545. The pantry is located in the First Church basement; however, there is a bin on the right wall inside the doors to the Connector for drop-off if donations come in on different days. Note: We are collecting clothes. Please check your closets. Clothes may be put into the box next to the food collection bin. Time: Tuesdays from 3:00 to 5:00 p.m. Welcome to the Old Saybrook Food Pantry! If you are currently living in these towns that we serve; Madison, Clinton, Killingworth, Old Saybrook, Chester, Ivoryton, Deep River, Essex, Old Lyme, Lyme, and East Lyme you are welcome to shop with us. Our goal is to give out three days' worth of food. We give out canned goods, packaged food, fresh produce, meat, eggs, dairy, bread and other grocery items. For newcomers, we have a registration table where you can fill out a registration form. The form asks for your name, address, phone number, age and the name and ages of all the people in your household. Please bring a form of identification with your name and current address. Numbers are handed out randomly at 2:45 and the doors are open then. After 2:45 you can get a number inside. Starting at 3:00, numbers will be called in consecutive order. When your number is called, you will check in and then be given a shopping cart and bags if needed. To help save our trees, please bring your recyclable cloth bags. If you don’t have any, we will provide you with paper bags. There are volunteers behind the tables who will help you with your shopping. After shopping, there are volunteers to help carry your groceries to your car. If you would like to volunteer with us , please call 860-388-1988. Dear Laura - Thank you so much for taking the time to speak at our Hunger Banquet last week. Like I told the group that night, you work hard all day addressing the very issues we discussed, and then you make the time to share your experiences and insights with us. We appreciate it very much. We have had many positive comments about the evening. Thanks again for making it so meaningful. Can you believe it's 7:30 a.m. on a Monday morning and we're not the first ones here? Hope someone made the coffee and we were able to get sticky buns. Carol has choreographed the morning's activity based on what food we were able to get from the CR Food Bank and surplus meat from Stop & Shop. Today she has Kristin and Tammy doing Beef Stir Fry, Frank doing French Fries (I hope some make it to the Fish Sticks meals), Michelle making her famous Tuna Patties, Harry creating his Pasta with clam sauce, "newbie" Pauline peeling onions (the traditional initiation ritual), and KC doing ??? (not sure what that is but it looks good). Bo is doing his usual "go for" thing. As you approach the kitchen you will notice two things...the laughter and the total lack of air conditioning. Can winter be far behind? This morning we will cook 350 to 400 meals and be out by 11:30. From there many of us will eat and laugh together at the Pub. You must understand that this Pub break is "required" to give the bulk food time to cool before packaging and freezing...it's not just for good fellowship. We will have a different group of volunteers come at 1:00 to package and freeze the meals. They will be out by 3:00 at the latest. And yes we do adhere to the 2 hour 40 to 140 defree safe food handling rule. Many of our morning and afternoon volunteers return Tuesday to hand out the meals. It is gratifying to hear the compliments from our clients. Special offerings: Today there were extra cakes and pastries - also lots of freshly picked garden produce like kale, cucumbers, peppers, swiss chard and fresh herbs. Also the freezers were filled with a wonderful meat donation from Stop & Shop. Today's Challenge: No bananas - but we did have extra pears. No peanut butter...but we do have jelly! Some Team Details: This pantry has a dedicated group of 45 wonderful volunteers. They help in the morning and afternoon on both Monday and Tuesday. Most have been volunteering for many years! Also, The First Church "Heat & Eat" Team distributes hundreds of frozen meals every week which they cook with care so that guests with limited cooking facilities or disabilities can have home-cooked meals they can heat up in a microwave. Above and Beyond :A special area is always set up in the Fellowship Hall waiting area with donated items like clothes and house wares. Also there is usually a table with an "extra" something - today it was shampoo. At registration today there were lollipops for the kids. Job: I help resupply all the stations, and manage the inventory, recording all the donated and purchased food. Favorite thing: I'm a very detail-oriented person - I like to take a big mess and organize it! How did you join the Team? This is my church. My husband Larry was instrumental in bringing this pantry here 15 years ago. Fun Fact: I was once in a stage production of South Pacific, and did a tap dance in a two-piece bathing suit with fish nets all over it. Job: I distribute fresh vegetables, and I help bag up the vegetables from the garden. I've helped with eggs, cheese and other things in the past. Favorite thing: The assortment of people - new faces and some that go back before me. I love meeting new people! How did you join the Team? I'm 88 and I worked until I was 85. This gets me out doing things. I volunteers at the Estuary & the Chamber of Commerce also. Fun Fact: I'm not married but I was engaged 3 times! I'm a very independent person. Job: In the morning, I'm in charge of getting the breads and desserts ready. In the afternoon I go wherever Laura needs me. Favorite thing: The camaraderie of all the volunteers! A group of my friends help here - we come in the morning, go out to lunch together, and come back and help more. How did you join the Team? When I retired from the bank, I came here to help. I'd always wanted to. About You: I brought up 3 boys by myself, and they all turned out great! Take I-95 South to Exit 68. At Exit 68, take ramp right for US-1 toward Old Saybrook. Keep straight onto US-1 South. Turn left to stay on US-1/SR-154/Boston Post Road. Turn left onto SR-154/Main Street. Arrive at 366 Main Street. Take I-95 North to Exit 66. At Exit 66, take ramp right and proceed to light facing US-1/Boston Post Road. Take left onto US-1 and proceed through 4 stop lights. At fork facing Henny Penny gas station, bear right onto Old Post Road. Proceed approximately 1 mile to stop sign. Turn right and proceed to stop sign - facing First Church, which is on Main Street. Turn left onto Main Street and then a quick right into the parking lot behind the church. Take Route 9 South to Exit 2. Depart ramp right toward Old Saybrook/Middlesex Turnpike. Turn left onto Essex Road. Bear left onto Springbrook Extension. Turn left onto SR-154/Middlesex Turnpike. Keep straight onto US-1/SR-154/Boston Post Road.